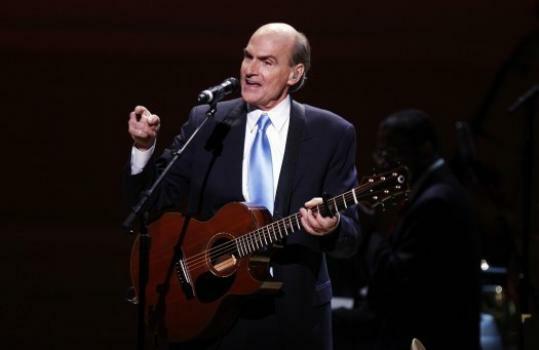 James Taylor is no stranger to Carnegie Hall. Indeed, he made his first appearance in 1970, but last night he admitted with a chuckle from that venerable stage that he was a little hazy on the details of that debut. That was all that the seminal singer-songwriter was unsure of, as he and an all-star supporting cast of friends, including Bill Clinton, gathered to celebrate the venue’s 120th anniversary with a superb, nearly two-hour tour through its history with popular music. The performance was also the first in a four-part “Perspectives’’ series dedicated to aspects of Taylor’s career that will include shows April 20, May 6, and May 9. Taylor proved an excellent host and centerpiece, kicking things off with a sly, acoustic take of “There’s No Business Like Show Business.’’ Sometimes Taylor and his stellar backing band were the main attraction. At other points he played the happy sideman. Taylor closed the evening with “Over the Rainbow,’’ in tribute to another famous Carnegie Hall alum, Judy Garland.